1 variant. Weight 200 kg. This is exercise for the time. Load with attached handles will be carried in hands (between legs) at a distance of 50 m in the shortest period of time. The load can be lowered. If the athlete did not take the weight to the finish line during the limited time – 90 seconds – the result is determined due to the passed distance. Straps are not allowed. 2 variant. Weight 175 kg. 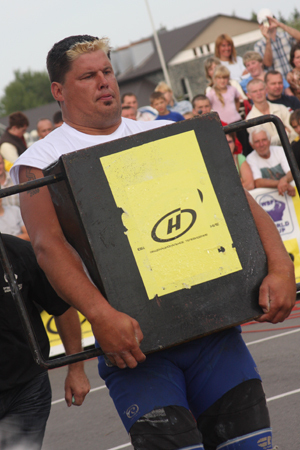 Flat metallic box (flat load made ​​in the form of contours of the country where the tournament is held, without handles on the sides) is removed by the athlete after start signal from the base and is carried away in front of the athlete as far as possible. Time is unlimited.